The Leaf makes its European debut in Portugal and the Netherlands in December, followed by the U.K. and Ireland two months later. LONDON (Bloomberg) -- Nissan Motor Co., the Japanese automaker trying to make its Leaf electric car affordable, says it expects governments to begin phasing out incentives in three years, denying consumers the full benefit of cost savings from bigger scale and better technology. Governments won’t provide sales subsidies indefinitely and may begin a phase-out when current commitments expire in three years, Nissan Senior Vice President Simon Thomas said Monday in an interview here, where he announced European prices for the Leaf electric car. The Japanese carmaker is relying on incentives to price its mid-sized Leaf below 30,000 euros ($37,000) in most European markets and compete with gasoline-electric hybrids from Toyota Motor Corp. and Honda Motor Co. The company may find that economies of scale from increased production may be offset by diminishing payments, Thomas said. The Leaf makes its European debut in Portugal and the Netherlands in December, followed by the U.K. and Ireland two months later. The initial countries were chosen in part because of incentives, typically worth 5,000 euros per car, Thomas said. Pressure to slash national spending is mounting in Europe because of the region’s debt crisis. European Union finance ministers and the International Monetary Fund have pledged almost $1 trillion to bail out Greece and prevent defaults. The U.K.’s new coalition leadership is considering 6 billion pounds ($8.7 billion) of immediate cuts to tackle a budget deficit. Nissan and 44 percent-owner Renault SA, under shared CEO Carlos Ghosn, have committed to invest 4 billion euros to develop and produce electric cars and batteries. While Ghosn predicts that the vehicles will represent 10 percent of global car sales by 2020, consultants including Advanced Automotive Batteries and the Boston Consulting Group foresee a much smaller market share. “The uncertainties about battery longevity, inconvenience of limited range and lengthy charging times mean that electric vehicles are likely to remain a niche product for the foreseeable future,” said Mike Tyndall, a London-based automotive analyst at Nomura Securities. 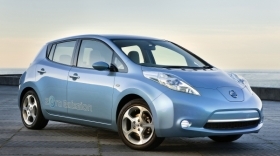 The Leaf will be introduced across Europe by the end of next year, Yokohama, Japan-based Nissan said Monday. The first four markets were also chosen for their plans to offer a recharging infrastructure for electric cars, Thomas said. The executive declined to confirm a May 13 Wall Street Journal report, citing U.S. sales and marketing chief Brian Carolin, that Nissan expects to break even on the Leaf in the car’s third year. “All we can say is that the program will be profitable over its life cycle,” Thomas said. Batteries for European-built cars will initially be shipped from Japan, leaving scope for big savings on transport costs and import duties when the two carmakers have battery plants operating in England, France and Portugal, Pierre Loing, Nissan vice president for product planning, said Monday in an interview. “Between these savings, technology improvements and economies of scale as production ramps up, we should be able to avoid losing money even as incentives are phased out,” Loing said.